It is hard to imagine we actually made it through 2017, a very-terrible-no-good year on so many fronts. Our work continues, to document the impact of occupation, siege, and racism through the lens of health and human rights. This is the fifth edition of the monthly Health and Human Rights Media Watch. Members of the Health Advisory Council volunteer to monitor relevant organizations and websites and compile a list of important news and issues which are summarized here. These newsletters will be posted on our website and archived as a resource. The Israeli government has had a long standing policy of detaining and deporting African migrants, often to Rwanda where they have been horrifically abused and trafficked back to the Mediterranean. Israel does not give the migrants documents certifying their status as refugees, asylum seekers, or any other legal status in Israel. They tell them that they will be given documents in Rwanda, but that’s a lie. This means they cannot seek political asylum or legally cross borders no matter what happens to them. Then they’re trafficked through a smuggling network from Rwanda to Uganda to South Sudan to Sudan to Libya to Italy or other European shores. Traffickers each take a cut of the $3500 that the Israeli government pays each migrant to leave. The Israeli Knesset recently approved a bill advocating the expulsion of asylum seekers, also known as the anti-infiltration bill. Seventy-one lawmakers supported the bill and 41 opposed it. Among other measures, the bill would imprison asylum seekers if they violated the geographical limitations imposed upon them. The Palestinian Center for Human Rights publishes a detailed and well researched weekly report on Israeli human rights violations in the OPT. From December 14-20 they meticulously documented assaults, killings, bombings, incursions, arrests, closures, restrictions on movement, house demolitions, and restrictions on NGOs. They recorded and analyzed actions designed to create a Jewish majority as well as Palestinian responses to Trumps decision to move the US embassy to Jerusalem. This week they ended with a call to action to the international community. Compare all of this data to what we see in our mainstream media. A Palestinian man was critically injured after Israeli forces shot a live bullet into his back during clashes that erupted in the Qusra village southeastern Nablus. An official who monitors settlement activity in the northern occupied West Bank told Ma’an that Ahmad Fayiz Hasan, 24, was critically injured during clashes. Hasan was transferred to the Rafidiya Governmental Hospital in Nablus by crews from the Palestinian Red Crescent and was immediately sent into surgery. Palestinian medical sources said that the bullet entered through Hasan’s back and settled into the left side of his chest. Witnesses told Ma’an that locals tried to push out the dozens of Israeli settlers who raided the village in an attempt to provoke people, causing clashes to break out. An upwards of some 600,000 Israeli settlers reside in occupied Palestinian territory in violation of international law. The total number of Palestinians detained by Israeli forces since the beginning of the protests that followed US President Donald Trump’s’ recognition of Jerusalem as Israel’s capital was 490, including 148 minors and 11 women. The High Court’s decision is being described by some as the most important legal development for interrogations and torture in some two decades; as a report in The Jerusalem Post put it, “essentially, the court took the state’s side on all of the key issues before it”. This ruling gives a veneer of legality to egregious practices that are internationally recognized as torture. According to Medical Aid for Palestinians (MAP) Israeli forces have been attacking and impeding the work of Palestinian medical workers in the West Bank and Gaza Strip as well as attacking and sometimes killing unarmed civilians. They shot in the head an unarmed man with bilateral lower limb amputations who was 50 meters from the Gazan border and posing no credible threat. Important summary and details on the arrest and detention of Ahed Tamimi who was standing in the courtyard of her home when Israeli security arrived. 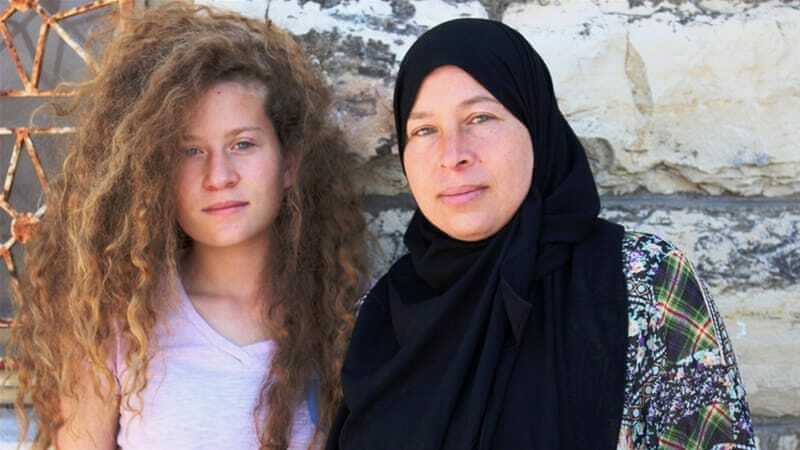 Ahed’s mother Nariman went to the police station to be present at her daughter’s interrogation, but was also arrested and detained as was her cousin Nour. Fourteen-year-old Muhammad Fadel al-Tamimi remains in a medically-induced coma, days after he was shot in the face with a rubber-coated steel bullet by Israeli forces. The Palestinian teenager, a resident of the central occupied West Bank town of Nabi Saleh, was injured during clashes in his village on Friday. According to locals, the bullet settled in the boy’s skull after it entered his face below his nose and broke his jaw. The teenager is currently being held in the ICU of the al-Istishari Hospital in Ramallah. His cousin, 17-year-old Ahed al-Tamimi, was detained on Tuesday morning by Israeli forces for slapping and kicking Israeli soldiers on the same day that Muhammad was injured. Applications for exit permits from Gaza to obtain medical care are increasingly being delayed or denied for patients as well as their family members. In 2017 44% received no response; 20% were for children under 18, 8% were folks 60 and over. This creates a bureaucratic nightmare, missed appointments, rising morbidity and mortality, and trauma for the entire family. Gazans seeking to obtain medical care also face a shortage of fuel, electricity and stock medications needed for cancer therapy. The percentage of unanswered applications for exit permits for medical treatment has nearly tripled over the past four years. A Palestinian child from the Gaza Strip died after succumbing to wounds he sustained during the Israeli offensive on Gaza in 2014, when he was just one years old. Medical sources in Gaza told Ma’an that four-year-old Muhammad Saleh Haddaf was severely injured and left bed ridden after an Israeli airstrike hit his home on August 8, 2014, killing four of his family members and injuring several others. According to the Palestinian Ministry of Health in Gaza, some 2,147 Palestinians were killed during the 51-day Israeli offensive on Gaza in 2014, including 72 who later succumbed to their wounds. UN records state that somewhere between 72 to 84 percent of Palestinians that were killed were civilians, hundreds of them children. In an urgent appeal to the Government Coordinator for the Occupied Territories and to the Executive Director of the Ministry of Health, Physicians for Human Rights Israel demanded they should improve procedures and approve the request of cancer patients to exit the Gaza Strip for essential care. The letter calls for an immediate review by the Ministry of Health of all applications of women with cancer and to enable their exits from Gaza for life saving treatment.